The first few months of the 2005 hurricane season, which began June 1, took off with a vengeance. Already, eight significant storms have formed over the Atlantic, from which two grew into major hurricanes that included Emily  the strongest July hurricane on record. 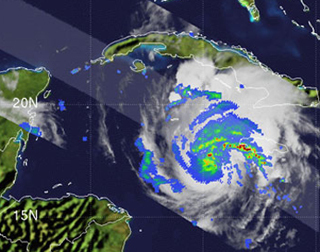 Hurricane Emily reached Category 4 intensity (sustained winds up to 155 miles per hour) July 17, just southwest of Jamaica. The record-breaking fifth named storm by mid-July signaled a fast beginning to the 2005 Atlantic hurricane season. Emily was downgraded to a tropical storm by the time it reached southern Texas. Image is courtesy of NASA. Such high activity early in the season, in addition to ripe oceanic and atmospheric conditions, led the National Oceanic and Atmospheric Administration (NOAA) to revise its hurricane outlook. Released Aug. 2, NOAA's new outlook indicates an increase in the number of expected hurricanes. And they say that the majority are yet to come. "Typically June and July are quiet months," says Chris Vaccaro of the NOAA National Weather Service. Hurricane activity usually culminates in late August and goes into early October. "But this season, we have seen a record number of storms form," he says. "We haven't even entered the peak of the hurricane season yet." The NOAA outlook projects a number of overall storms, hurricanes and major hurricanes throughout the entire Atlantic basin, which includes the Atlantic Ocean, the Gulf of Mexico and the Caribbean Sea. NOAA produces two outlooks: The first is released in May prior to the onset of hurricane season, followed by an update in August just before the season peaks. And when hurricane season draws to a close at the end of November, NOAA recaps the predictions and the final outcome of the season. This year, the May outlook correctly predicted an above-average season that called for between 12 to 15 tropical storms, with seven to nine becoming hurricanes, and three to five of these becoming major hurricanes. The updated outlook, however, upped the numbers for the total season to between 18 to 21 tropical storms, with nine to 11 becoming hurricanes, and five to seven of these becoming major hurricanes. Multiple factors led to the increased number of storms. First, hurricanes need warm water temperatures to strengthen and sustain them, Vaccaro says. And this year, Atlantic water temperatures have ranged anywhere from 2 to 4 degrees Fahrenheit warmer than average. Second, the wind in the upper levels of the atmosphere that blow in the direction countering the storms' movement, known as wind shear, has been lighter than normal. "So, when these storms have been forming, they haven't encountered much resistance," Vaccaro says. "And therefore they have been able to increase in intensity." Finally, easterly winds from Africa must be in place in order to bring tropical disturbances west. The chart (top) measures the degrees above or below the normal sea-surface temperature for the month of July. Temperatures were well above normal, especially within the main hurricane development region depicted by the black box. Red shading on the chart (bottom) shows lower than average vertical wind shear within the same region. Images are courtesy of NOAA. Such favorable hurricane conditions, however, did not come as a surprise to researchers. "They don't randomly come together," says Gerry Bell, the lead meteorologist at NOAA, nor are they the result of global warming. 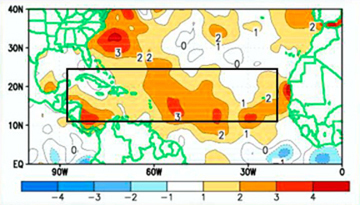 Instead, the conditions exist together as part of a cycle called the tropics-wide multi-decadal signal. Although its cause is not known, the 20- to 30-year cycle has been observed since the 1800s to control both water temperature and wind patterns and is "by far the dominant climate pattern," Bell says. "Overall, those conditions all occur together." 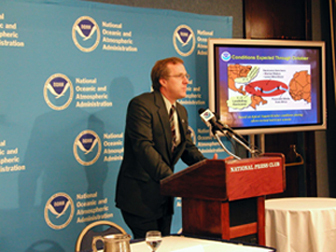 Gerry Bell, lead meteorologist on NOAA's Atlantic Hurricane Seasonal Outlook, announced Aug. 2 a revised hurricane outlook at a Washington, D.C., news conference. The revised outlook calls for an increased number of hurricanes. Image is courtesy of NOAA. 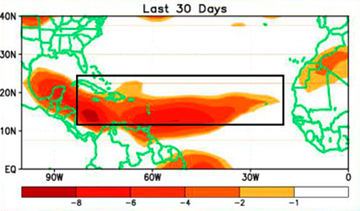 Another potential influence to the severity of hurricane seasons can be the El Niño Southern Oscillation (ENSO), with La Niña conditions favoring hurricanes and El Niño conditions discouraging them. According to NOAA, however, ENSO events were neutral this year and will not affect the hurricane season. But as the peak of the multi-decadal cycle approaches, NOAA expects conditions to be sufficient for a large number of storms. Still, of the predicted 18 to 21 total storms, not all make landfall, Vaccaro says. "But it's reasonable to say that an additional two to three could very well hit the United States based on what we've seen in past hurricane seasons similar to this one." Everyone from southern Texas to Maine should be prepared for hurricanes this season, Vaccaro says. "Hurricanes do not discriminate. They will end wherever the atmospheric patterns lead them."